Add instant glamour to your look. With this beautiful open kick 9ct yellow gold and cubic zirconia ring. A lovely gift for someone you care about. 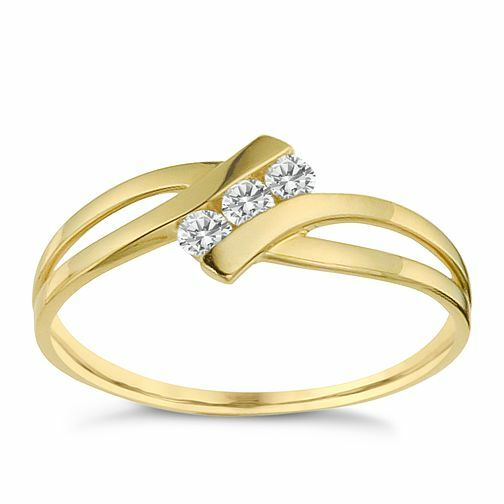 9ct Yellow Gold Cubic Zirconia Ring is rated 4.0 out of 5 by 4. Rated 5 out of 5 by Anonymous from Perfect fit So pleased with my choice. Looks lovely on and fits perfectly. Thank you for your excellent service, I find buying on line gives me the opportunity to take time when looking for something I have in mind. Your web site is so well dispayed and choice is good. Rated 1 out of 5 by Anonymous from Thin rough gold ring Sadly not impressed with the ring, it was sized very small, was very rough feeling and the edges were very pointy and rough also. Unfortunately sent it straight back. Not worth the value.